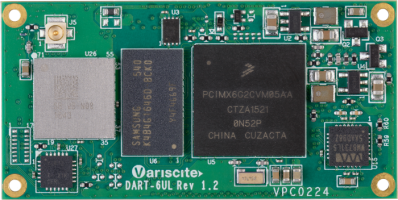 Supporting the i.MX 6UL/6ULL, the DART-6UL allows designers to use a single System on Module in a broad range of applications to achieve short time-to-market for their current innovations, while still accommodating potential R&D directions and marketing opportunities. This versatile solution’s -40 to 85 °C temperature range and Dual CAN support is ideal for industrial applications. Register at Variscite Customer Portal to get high quality engineering support for this product.